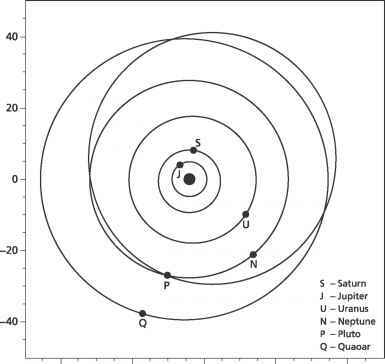 Figure 6.4 The interior structure of Earth. The crust varies in thickness. It is thicker under the continents and thinner under the oceans. Unlike the other terrestrial planets, Earth's crust is divided into several separate solid plates, and these move around on top of the hot mantle material. The continents are attached to the plates. Some plates are moving towards each other; when they collide, material builds up to form fold mountains (such as the Himalayas). When plates are moving apart, molten material from the mantle often gets drawn up, creating new crust; this occurs along the Mid-Atlantic Ridge between South America and Africa. 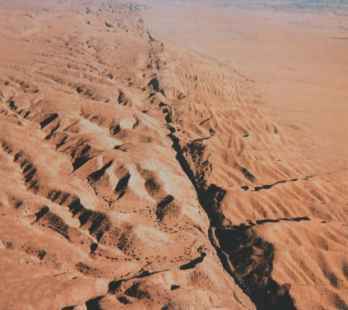 Other plates are sliding past each other in a slow butjerky motion; the San Andreas fault in California is one example. Sometimes an oceanic plate slides underneath a continental plate, causing a deep trench (subduction zone) and mountain ranges; the Andes Mountains in South America were formed this way. Where plates interact, earthquake and volcanic activity occurs along the boundaries. 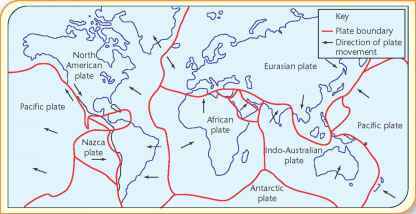 Some volcanoes and earthquakes do not occur along plate boundaries, but in places called 'hot spots' - this accounts for the occasional earthquake in Australia, which rides in the middle of a plate. The slow movement of plates (a few centimetres a year) is driven by convection currents and tectonic forces in the mantle. Figure 6.5 Map showing the major plate boundaries of Earth.